What's the different between fasttext skipgram and word2vec skipgram? for convenience, just list all 4-gram. What will fasttext skipgram do? The optimization criterion is the same, the difference is how the model gets the word vector. There is a sum over all words wc and approximate the denominator using some negative samples n. The crucial difference is in the function s. In the original skip-gram model, it is a dot product of the two word embeddings. Word wt is represented as a sum of all n-grams zg the word consist of plus a vector for the word itself. You basically want to make no only the word, but also all its substrings probable in the given context window. Not the answer you're looking for? Browse other questions tagged nlp fasttext or ask your own question. How to convert gensim Word2Vec model to FastText model? 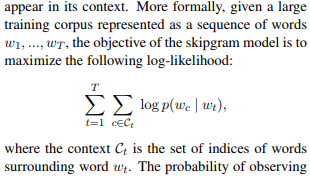 Difference between CBOW and Skipgram gradients in word2vec? what are the main differences between Fasttext and Pytext?